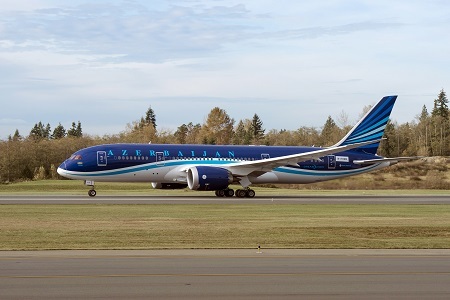 Boeing and Azerbaijan Airlines today announced the delivery of the airline’s first 787 Dreamliner. With this delivery, Azerbaijan Airlines becomes the first airline in the Commonwealth of Independent States to operate the 787. The airplane will play a key role in the Baku-based airline’s strategic plan to expand its long-haul fleet. The 787 is a family of technologically advanced, super-efficient airplanes with new passenger-pleasing features. In addition to bringing big-jet ranges to midsize airplanes, the 787 will provide Azerbaijan Airlines with unrivaled fuel efficiency and environmental performance, using 20 percent less fuel and with 20 percent fewer emissions than the airplanes it replaces. Based at Heydar Aliyev International Airport in Baku, state-owned Azerbaijan Airlines (AZAL) is the national carrier of Azerbaijan. Azerbaijan Airlines currently flies a network of over 20 global destinations across the United States, China, Commonwealth of Independent States, the Middle East and Europe. In addition to providing airlines with unprecedented fuel economy and low operating costs, the 787 features a host of new features that greatly enhance the passenger experience. Passengers aboard the 787 experience cabin environment improvements such as dynamic LED lighting, the largest windows, bigger overhead bins, a lower cabin altitude, a more humid environment, low interior noise, cleaner air and a smoother ride. To date, 58 customers from around the world have ordered 1,055 787 Dreamliners.